Kiosk is fixed at a 50° angle in horizontal format for ideal viewing. Home button is concealed to avoid patrons from navigating away from presentation. Case holds the Apple® 2nd, 3rd & 4th generations. Dual locking enclosure and a Kensington lock kit for security. 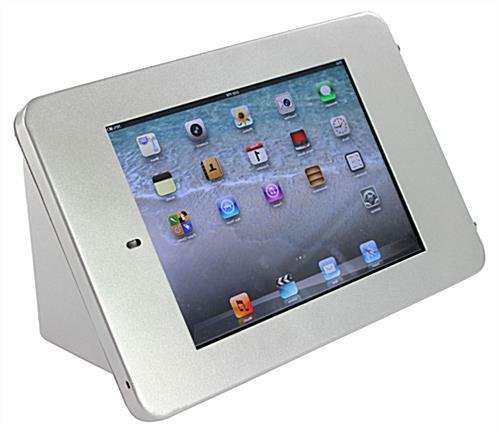 Constructed of steel and aluminum with satin silver finish has modern style, ideally suited for commercial environments. 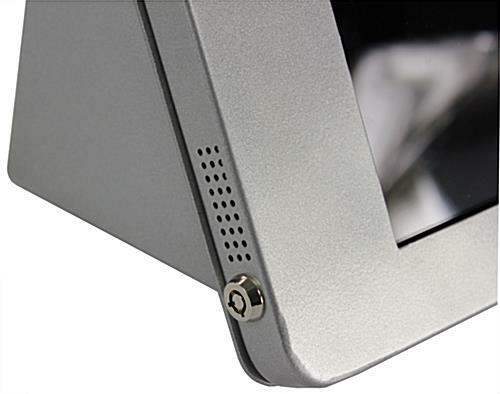 The tablet will be safe inside with desktop iPad stand since there are (2) push locks on the enclosure. Two sets of keys are included so more than one manager can open the enclosure if one happens to be off duty. 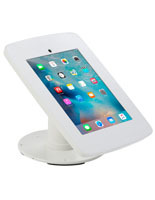 This desktop iPad stand features a rear opening so the tablets can be charged in the kiosk. The capability to charge an Apple device while still secured in the display is critical for many retailers, as the tablet will be in well in excess of 8 hours. 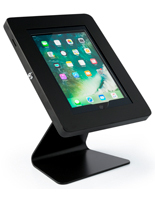 During the design process of this desktop iPad stand, the team of engineers understood what qualities were important for retail tablet enclosures. Most of the countertop displays on the market today lack some important features and the viewing range is often poor. 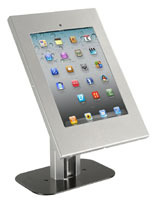 What are most businesses looking for in a desktop iPad stand? In descending order of importance those features include security, customer-oriented design, durability, and lastly style. 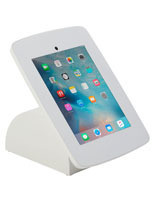 This desktop iPad stand is one of the most popular displays on the internet due to the simple design and security features! This enclosure is sold with a Kensington lock kit. When used with lock and adapter, this touchscreen device holder becomes theft proof. 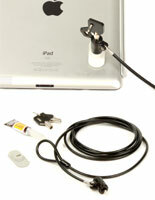 A desktop iPad stand is an innovative point of purchase tool. Finally, with the introduction of this product line, those demands are met. 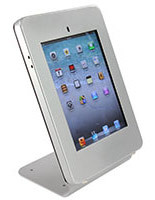 This desktop iPad stand is made of steel with a powder-coated finish. The matte silver color is contemporary, yet subtle. 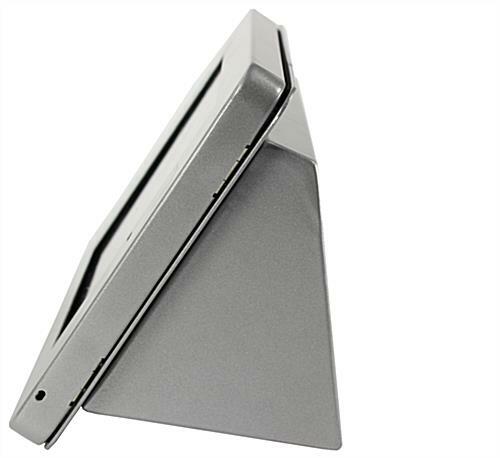 This desktop iPad stand has a 50° tilt so a client standing above the holder will not have to strain when trying to see the screen. Please note, the enclosure holds Apple devices in horizontal format only and is fixed at the 50° tilt; this display is not adjustable. 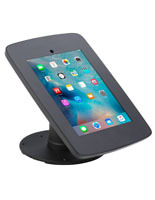 When in-stock and ordered before 1PM EST, Monday – Friday, this desk tablet holder ships the same day! 11.8" x 78.0" x 6.3"